Last year, we were proud to launch the responsive version of StudyLink.com – which enabled phone and tablet users to use StudyLink.com with the same ease as desktop and laptop users. 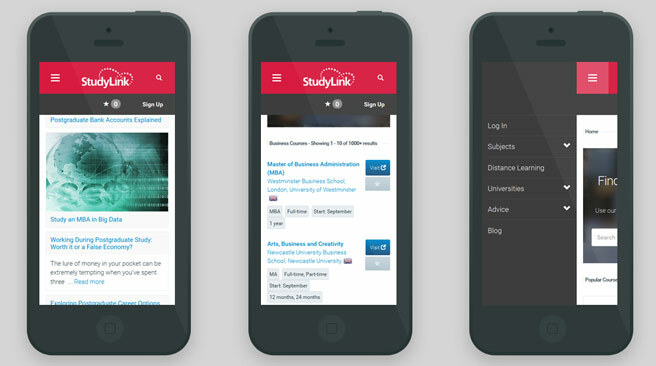 This year, we have gone one step further and adopted mobile-first philosophies with the new design for StudyLink.co.uk. The resultant user experience on phone and tablet sized displays is close to that of native apps, whilst laptop and desktop users enjoy the brand new website design in it’s full size. Advert positions were revised to fully benefit from the mobile-first design of StudyLink.co.uk. Existing popular ad units such as Skyscraper adverts, Text adverts and Spotlight adverts were retained and more closely aligned with page copy. In addition to these, the MPU banner position which has proved so popular on StudyLink.com has also been introduced to StudyLink.co.uk. Finally, the brand new Popular course position has been introduced on the homepage and all subject directories. This position is a fully responsive ad unit which transitions based upon display size, meaning your advert is always optimised, no matter the size of the students device. The Popular course position has been styled to reflect our course search results and is the ideal method of using display advertising to promote individual courses or to reinforce your course listings. StudyLink.com and StudyLink.co.uk have always been good at generating high quality referral traffic to your domain. 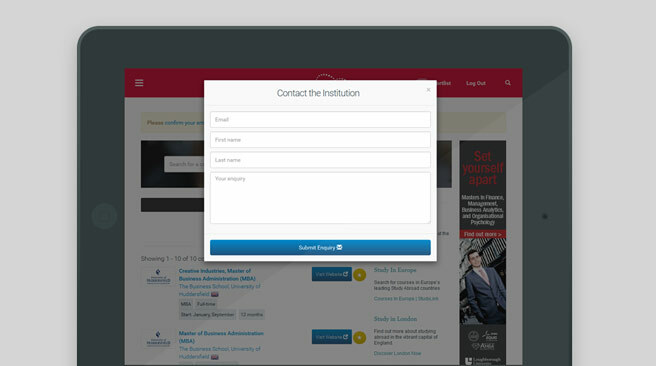 We decided to add to this in the past year by introducing easy to add optional enquiry forms to your profile and course listings, giving you the option of using your advertising with StudyLink to develop student leads. These enquiry forms have now been re-styled on StudyLink.co.uk to make the process of enquiring even simpler for students. 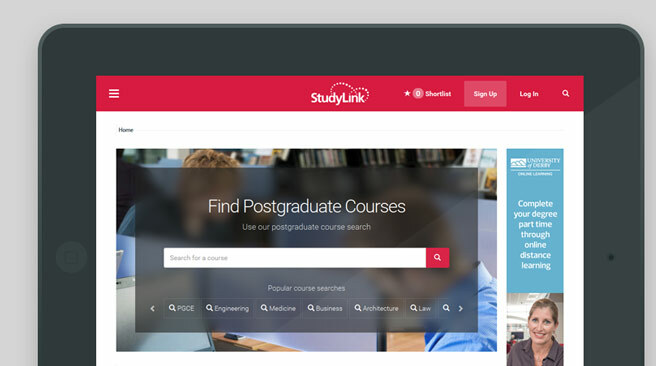 StudyLink.co.uk’s new design also includes exciting new course shortlisting functionality to further improve upon the lead generation possible with StudyLink. Users can now sign up and save their favourite courses, building up a shortlist of each course they are considering. As well as making it simpler for students to keep track of the courses they are interested in, they are now also able to easily enquire to all courses in their shortlist with our new ‘Enquire to All’ functionality. User sign up and course shortlisting means more opportunities for your course listings to be viewed by potential students, and more opportunities to receive potential leads from students. With the new design of StudyLink.co.uk, we wanted to put the important things first. You may notice that the menu bar has been simplified at all display sizes. This has been done to place more emphasis on the course search tool, which is now highly prominent on all non-profile pages. The course search tool is our most important design element, as it is through this that students are able to find your courses. The course search tool is joined by context sensitive popular course suggestions to help students make their first searches. The menu has not been forgotten however and is now been divided into left and right slide out menus, similar to those used in many popular mobile applications. These are easily triggered on mobile through to desktop sized displays, allowing our navigation menus to display a large amount of information whilst not distracting attention from the main elements of our pages. Whilst the left menu allows students to find their way through our directories of information, the right menu ensures that the course search tool is always just a press away, no matter where the student has scrolled to in a page and no matter what device is used. The best thing about the new StudyLink.co.uk is that you do not need to do anything to your profile advertising to benefit from the new design. Course listing and Profile page layouts have been improved but nothing has been removed, so your content can remain the same and it will look better with our new design. Display advertising that you had on the previous design has been carried over to the new design, and will benefit from the mobile-first design philosophies behind the new layout. We are very proud of the steps we have taken with the new StudyLink.co.uk and we hope that you get the chance to look at the changes we have made. Please get in touch with us if you have any further questions or would like to know more about the changes to StudyLink.co.uk.